This has to be the quintessential Scottish dessert. Comprising almost entirely of classic Scottish produce; raspberries, porridge oats, honey and Scotch whisky, they are flavours that compliment eachother perfectly. You can’t really go wrong here in terms of method and quantities, if you just throw all of it together in a bowl and mix, you couldn’t fail to end up with something delicious. Normally though, the cream is whipped to form soft-peaks to provide some body and texture. Also I have crushed some of the raspberries with honey to make a kind of sauce, and also cooked the oats with the honey to form crunchy clusters which give some bite when folded through the cream. Make the honeyed oats; toast the oats in a dry pan until lightly coloured. Add 2 tablespoons of the honey and a pinch of sea salt, stir until reduced and the oats forms clusters. Transfer to a tray and leave to cool. Take half of the raspberries and place in a pan with the remaining 2 tablespoons of honey. Stir over a high heat to make a sort of compôt. Bring to the boil then remove and allow to cool. Place the sugar, cream and whisky in a bowl and whisk until soft peaks form. Mix in the whole raspberries, saving a few back for garnish, about half of the raspberry compote, and most of the honeyed oats, saving some for garnish. 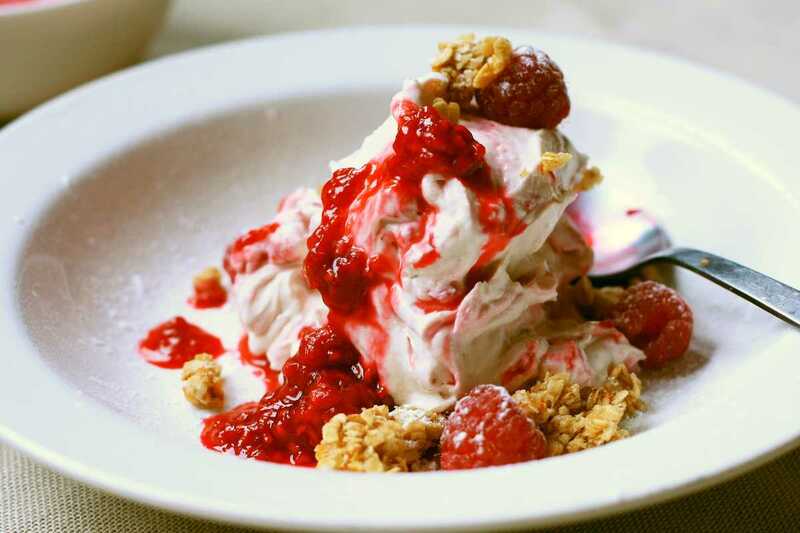 Fold everything together to create a marble effect, then serve into bowls, finishing with the whole raspberries, honeyed oats and compote. Finally dust a little icing sugar over the top.